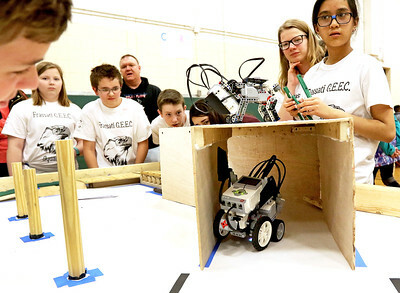 Candace H. Johnson Brendon Jordon, 13, Sam Sheedy and Keno Barba, both 12, all with the AUGS Robotics Club team, The Snowflakes, watch their robot go through the obstacle course they named the Antioch Dog Park, during the third annual 4-H Robotics Showcase at Antioch Upper Grade School. Candace H. Johnson Brendan Collins, 13, of Mundelein, with the Frassati G.E.E.C. 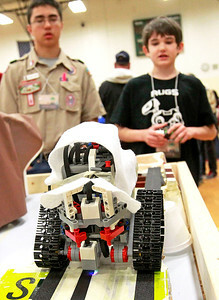 Squad works with his team's robot as it does a test run getting through an obstacle course during the third annual 4-H Robotics Showcase at Antioch Upper Grade School. 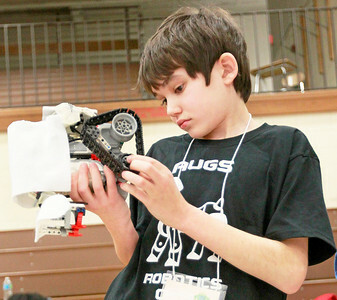 Candace H. Johnson Transfig Hounds Elizabeth Strelecki, 11, Arianna Conzelman, 10, and Andy Sierva, 11, watch their robot go through an obstacle course as Micaela Ackerson, 11, of Wauconda works on controls during the third annual 4-H Robotics Showcase at Antioch Upper Grade School. Mrs. Debbie Dam, of Fox Lake, a parent volunteer, supported the students behind them. 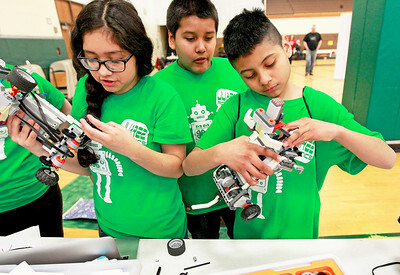 Candace H. Johnson Students Isabella Flores, 14, Anthony Lupercio, 12, and Brian Sanchez, 11, all from the Miguel Juarez Middle School in Waukegan, work on their dog robots during the third annual 4-H Robotics Showcase at Antioch Upper Grade School. Candace H. Johnson The Frassati G.E.E.C. 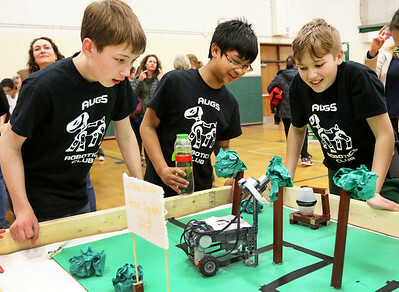 Squad watches their robot go through an obstacle course they designed during the third annual 4-H Robotics Showcase at Antioch Upper Grade School. 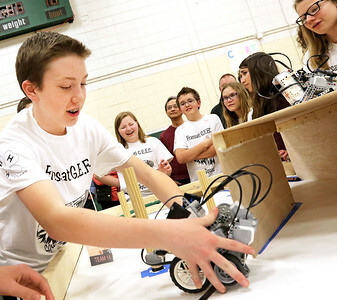 Candace H. Johnson James Stefo, 16, of Antioch stands next to Jeffrey Myhra, 14, of Antioch as he watches his AUGS Robotics Club's Puppy Power robot go around an obstacle course during the third annual 4-H Robotics Showcase at Antioch Upper Grade School. 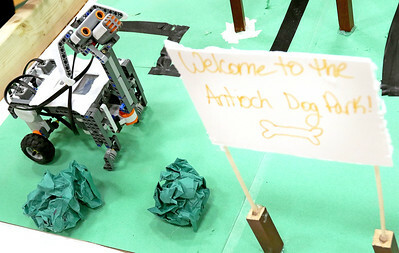 Candace H. Johnson An AUGS Robotics Club dog robot sits on an obstacle course designed as an Antioch Dog Park it is programmed to navigate during the third annual 4-H Robotics Showcase at Antioch Upper Grade School. 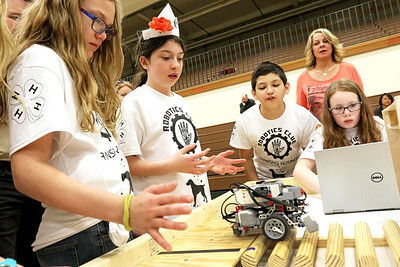 Candace H. Johnson Jeffrey Myhra, 14, of Antioch, with the AUGS Puppy Power robotics team, works on their robot during the third annual 4-H Robotics Showcase at Antioch Upper Grade School. The Frassati G.E.E.C. Squad watches their robot go through an obstacle course they designed during the third annual 4-H Robotics Showcase at Antioch Upper Grade School.